Above is a peek at the bay through dead trees at Bethel Beach. These are not trees which washed ashore willy nilly. They're trees from a forest that existed before the wind and sea declared otherwise. I'll talk about these more next week. Today's post is a continuation of yesterday's theme of who knows what, there is never any theme here local ghost stories. "A friend of mine and I were taking a boat from Mathews Yacht Club over to Moon post office. You go up Stutts Creek and then over to Billups Creek. It was just after sunset and everything was sort of misty. Then about a half mile from the mouth of the creek, we saw it. We both saw it, but couldn't believe it. I'd never seen anything like it before. There was a big sailing ship floating in the marsh. It had two or three masts and was made of wood. There's only a foot of water there but it looked like it was floating. It was the kind of ship the pirates used. We watched for about a hundred yards more and then it just disappeared. I went home and told my mother, but she just laughed. * She said everyone knew of the stories about the ghosts in Old House Woods." *She Just Laughed or We Just Laughed should be written across a souvenir T-shirt from tonight's only first official meeting of the Oyster Festival Planning Commission. Within one minute of the four of us sitting down, I was wiping tears of laughter from my eyes. It isn't every day that you take a preliminary sip of water only to find hillbilly dentures swirling around in the bottom of the glass. Etc. Thank God for Blog Friends and their incredible sense of humor. Happy Birthday to Noe Noe Girl, and thank you to the entire population of Shackelfords, Virginia, for tolerating four women who could not stop cackling. Well, at least one of them couldn't. This charming old barn hides in the middle of the woods down Onemo. The other day I drove down a dirt lane I'd never been down before (with good reason, it's a dead-end road and people live there). For reasons I can't explain, I looked into the woods to my right and there, just barely peeking through the trees, was this lovely structure. Since it was a very desolate spot--except for the homes nearby--I pulled the car over and dashed into the woods for the quickest of shots. Satisfied, I hightailed it walked back to the car. There was a ditch in between the barn and my car, and as I hightailed it negotiated it a wave of perfume hit me. A strong wave. There was no wind blowing that day, there were no flowers or blooming bushes nearby, and I was not wearing perfume. Besides, it smelled like an old lady's perfume, and I have three more years decades before I qualify for that particular scent. Mathews has many well-known ghost stories, most of which have to do with Old House Woods near one of our public beaches, Haven. There are stories about pirates, buried treasure, ships flying through the air, and strange figures wandering around at night. ...They'll run me down and sink me, I thought. I shouted to sailors leaning over her rails forward, but they paid no heed to me. Just as I thought she would strike me, the helmsman put her hard aport and she passed so close that I was almost swamped by the wash. She was a beautiful ship, but different from any I had ever seen. There are no ships like her on any ocean. She made no noise at all, and when she had gone by, the most beautiful harp and organ music I ever heard came back to me. ...Well, sir, I pulled up my anchor and started for home up White's Creek. I could see that ship hanging over Old House Woods, just as though she was anchored in the sea. And running down to the woods was a rope ladder, lined with the forms of men carrying tools and other contraptions..."
* CBW back again. I'm plumb scared too--scared that I'll get the award for Longest Post in History. More ghost stories tomorrow. For now, tell me about a strange phenomenon or something that scared you. That reminds me, I need to clean out my refrigerator. Welcome once again to Three Thing Thursday, where I mercifully set a limit on my random, scattered thoughts tell you three things and you share three things. 1. Saturday night Sandpiper Reef down in Hallieford is having a costume party for grownups, with the definition of grown being up for very loose interpretation. Baby Sister is supposed to attend as Wonder Woman. I wonder if she'll show up. I'm debating between a cowgirl and bride of Frankenstein, we'll see. It all depends on how quickly the swine flu germs overtake me settle into my system. 2. The swine are rampant at my paying job. Oops! No, what I meant to say is swine flu is spreading like wildfire at my work. 3. Today at one of my paying jobs I had to inspect a haunted house for swine flu germs safety concerns. My four years, three months and two days of college are really paying off. Now it's your turn to tell me three (or more) things, whatever you want. Anything at all. Just be sure to wash your hands before you leave, otherwise you're liable to spread the swine flu, which I don't have but am sure to come down with any minute now. Along with hypothyroidism. Above is a picture of some petrified crabs in a crab pot down at the Onemo public landing. Unrelated to inedible seafood is the November 6 & 7 Oyster Festival in Urbanna, which is about half an hour from Mathews County. * Although there no doubt will be plenty of spitting going on at this event, the spat referenced here is a cute way of saying there will be a Little Miss Oyster Festival crowned. Spat = baby/developmental oysters. Don't you love that word, "spat?" **Oh my. Marauding Parading firemen. Special entertainment. After a day chock full of oyster eating and spat crowning. Does it get any better? *** Mental P Mama is coming down for this wondrous event, and I'm thinking we need to enter her in the oyster shucking contest. Based on how quickly she took the foil wrap off a wine bottle--using her teeth--this summer, she has to be a champion at opening an oyster. According to The Rivah publication, more than 100 vendors will be on site, and over half of them will be food booths. In addition to fried, raw, roasted, steamed, frittered or stewed oysters, you can sample "crab soup, seafood chowder, clams, crab cakes, shrimp, fish, corn dogs, sausages, ...turkey legs, funnel cakes, candy apples, etc." There will be crafts including "handmade furniture, stained glass, woodcarvings, sculpture, pottery,...leather goods, jewelry and more." Bands will perform on five stages throughout the town both days. Certain bloggers will be turned loose on all this, so be forewarned, Urbanna. "No water taxis will be operating. The use of the Upton’s Point Marina dinghy dock is available ." Upton's Point dinghy dock? Upton Point's dinghy dock? Dinghy dock? Dingy? Dock? Fried Oysters as far as the eye can see? Holy spat this is going to be good. p.s. If you wish to join us, please do. If you already expressed interest, we have you on the list but would still like to hear back for sure that you're coming. There's plenty of room here at Chez Chesapeake Bay Woman as long as you can put up with a whole lot of spat. These past few days have been chock-a-block full of interesting news articles about our plum crazy interesting little neck of the woods here in the Tidewater area of Virginia. In addition to yesterday's story about live blue crabs clickety-clacking all over Interstate 64, we also had a "light plane crash" in Gloucester (nobody was injured). MATHEWS - Rumors may or may not prove true, but property deeds don't lie. The hot topic lately around Mathews is that Tom Cruise and his wife, Katie Holmes, have forked out $16 million for "Green Plains," a 643-acre estate on the North River with a seven-bedroom brick mansion. It's certainly not beyond the realm of possibility. Presumably the man whose movie credits run from "Top Gun" to "Mission Impossible" to "Jerry Maguire" has the money. He's also no stranger to these parts, having filmed the 2002 movie "Minority Report" in nearby Ware Neck — across the North River from Green Plains in Gloucester. Locals say he fell in love with the area and Ware Neckians count Cruise as a friend. "They call him by his first name," said Donna Vaughn, who runs Nuttall Country Store in Ware Neck. "Apparently he was very friendly with everybody." He even signed a photograph of himself and director Steven Spielberg that hangs in the store: "Every town in America should have a store like this," Cruise wrote. But, sorry, TomKat watchers: No purchase has been made. That's not to say Cruise isn't sniffing around Mathews, and specifically Green Plains. CBW's unnecessary editorial remarks here. Mathews is no stranger to famous people owning or possibly owning or not owning but looking or not looking and not owning or considering but not really considering owning property in the county. Regarding Tom "sniffing around Mathews" hopefully he will not do so at low tide on Queen's Creek or on a sweltering, humid day at the dump. Here we have a picture of some fiddler crabs around my basement shoreline. I often talk about the fiddler crab infestation in my basement this county. In certain lower lying areas they like to lounge around in the middle of my garage of the road making it nearly impossible for a driver to avoid running over the entire herd. (Any more than four fiddler crabs makes a herd, in case you didn't know, and like mice there's never just one fiddler crab.) The ladies who attended Blog Fest last summer can personally attest to the fact that these pint-sized crabettes scurry and dart right out in front of you, cackling with glee and pointing their oversized claw up in the air in defiance. There are many parts of the country and the world with unusual driving hazards. Once when I was in Montana a stray horse came out of nowhere and just took off down the center of the road with no rider, no saddle, no bridle. In Wyoming it's nothing to see bison crossing the road. (Remind me to tell you about the time I was chased by one of those creatures. True story. True nightmare.) But I defy you to find a place where crabs--which by the way live in or near the water, not in or near the middle of the road--are driving hazards. In case you think I'm exaggerating, I'd like to share a recent article about crabs on Interstate 64, a mere 40 or so miles from Mathews County, further inland. "A section of Interstate 64 was shut down for about two hours this morning after a truck overturned and spilled live crabs across the highway.Lauren Hansen, a spokeswoman for the Virginia Department of Transportation, said I-64 westbound was closed to traffic near mile marker 230 at Croaker around 7 a.m. after the box truck carrying crabs flipped over and spilled its payload.State police and private cleanup crews worked to clear the roadway, which was reopened around 9 a.m."
So there you have it, folks. Mathews County has herds of fiddler crabs darting in front of cars and nearby interstates are covered with bushel baskets of live blue crabs. Road kill takes on a whole new meaning. Wikipedia suggests that "roadkill can be eaten and there are several recipe books dedicated to roadkill." I'm thinking Mathews County's submission into such a cookbook would be called "Seafood Splatter." Have you ever seen crabs in the middle of the road? How about in your basement or garage? Or how about in your yard when you're cutting grass? Am I really the only one? What sort of a parallel crab universe do I live in, anyway? If not, what have you seen in or beside the road that might be considered strange or unusual? And now the moment you've been hoping would never arrive waiting for, another excerpt from the 1962 Mathews County Soil Survey by the United States Department of Agriculture. "...Mathews County lies along the Chesapeake Bay in the southeastern part of Virginia. It occupies low, nearly level marine terraces." CBW here, wishing to interrupt augment the above statement. Low doesn't even begin to describe things here. They need to mention that it's possible to stand in one's own yard and need scuba gear be below sea level. Now we return to the Soil Survey, already in progress. "...Mathews County has a total of 105 square miles, or 67,200 acres. Of this, there are 46,752 acres of land area, 8,938 acres of inland water and 11,520 of open water. 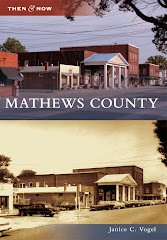 The town of Mathews is the county seat." CBW here again, wishing to apologize profusely for the use of so many numbers in one sentence. I was OK with that first 105, but after the 67,200 my eyes rolled back in my head because we don't do numbers very well, and when I say "we" I mean "me, myself and CBW" because I/she/we can shift from first to third person (singular or plural) quicker than the gears on a race car. "Elevations in the county range from sea level to about 70 feet. The average elevation is approximately 10 feet, but in a considerable area, the elevation is 5 feet or less." CBW here, wishing to point out that she is laughing hysterically at the above understatement. In fact, she's slapping her thigh and stomping her foot to punctuate that howling laughter. The only thing that's 70 feet above sea level around here is nothing if you exclude troposphere and the towers in the woods behind the high school. The bank along the Piankatank River at the bridge which connects us to Middlesex might be more than a few feet high, but otherwise the "considerable area" that is everything else is at or below sea level for all intents and purposes. Since the Soil Survey and I have come to a disagreement, I think it's time to call it a post. p.s. Unrelated to the Soil Survey, the photo above was taken at Bethel Beach. What drew me was the curvy "s" shape of the shoreline at low tide. I fixate on things like that and truly wish I could devote as much energy and attention to detail to other aspects of my life such as housework and bill paying, but thankfully it's Saturday and I will not entertain such hideous thoughts. May your Saturday be filled with thoughts of a curvy shoreline, with nary a bill or chore in sight. "In 1933 the Chesapeake Bay area was struck by a powerful storm, greater than any in recent memory. Six natives related their experiences on the island during the August 22-23 storm..."
"...on the night of August 22, I was sleeping beside a window and the wind was blowing a terrific gale...by mid morning...the view from this porch was as if you were on the ocean. The water was the color of milk, almost, because of the waves. They would hit the house and break over the kitchen. We had a 42-foot canoe that my father was concerned about and he went out to try to check on it. We could see his head at times. Sometimes we couldn't, because the waves would wash right over him, and my mother was screaming, because she thought something was going to happen to him..."
"...It got so dark and dreary that the hens and chickens went to roost! They didn't know, but it was a terrible time..."
"...Scrooch Callis, who operated the Callis's Mercantile Co. on Callis's Wharf at the time of the storm: "Well, I was living on Risbytown Road and I knew we were having a bad storm of course. Early that morning, possibly about 7 o'clock, my brother, who was captain of the ferry that ran from Callis's Wharf to Cricket Hill, came by and told me that water was in my store...when I got on the main road, you could see the water coming up and the seas were high enough that at one time, it knocked me over...I don't recall how high the water was then, but it must have been more than foot deep in there (the store), which was unusual..."
Chesapeake Bay Woman speaking now, though not about the Great Storm of 1933. Tonight at a community forum regarding the upcoming Board of Supervisors election, Blog Fest was mentioned as an example of how the county has the ability to draw tourists from all corners of the country but needs to reflect upon ways to lodge those people once they arrive. Of course they won't arrive at all if certain local bloggers keep posting stories about storms with waves big enough to knock people over, but this is neither here nor there. Also, I took the picture above yesterday at the public landing at Onemo. Those gloves sitting perfectly atop the crab pots just begged for attention, and I gave it profusely. There's a close-up shot that's better than this, but I haven't uploaded it yet. Happy Friday and Feliz Fin de Semana. Here we have a dead crab. And here in the next sentence we have Three Thing Thursday, where I tell you three things and you tell me three things, whatever you want, anything at all. 1. Because of an overnight field trip, Chesapeake Bay Daughter had to be up, packed and at a particular place--15 miles away--at exactly 6:30 a.m. this morning, "Or else!" the bus would leave her. That meant we both had to get up way earlier than usual, which for me is the @$$-crack of dawn already early enough. 2. I think that crab above looks like he's performing a ballet move. 3. Most of my life I've been able to distract myself from stressful events by completely denying they exist. Hence the shift from my daughter's stringent field trip requirements to a crab doing ballet and a convenient omission of everything in between. Now it's your turn. Tell me three things, tell me 42 things. Random or related. Pertaining to crabs or to ballet, I don't care. The world is your oyster. A crispy, salty, fried oyster. This is a shot of Queens Creek way back in the spring on an unusually foggy morning. Here in Mathews, our proximity to the water guarantees a fair share of unusual weather patterns; we're definitely no stranger to bad storms. One in particular, however, stands out as one of the worst on record: the Great Storm of 1933. According to the Baltimore Sun, the August 1933 storm was "one of the most severe storms that has ever visited the Middle Atlantic coast." This storm--a hurricane-- was "a slow-moving weather mass that dumped ten inches of rain a day for nearly a week even before wind gusts as high as 80 miles per hour and a 7-foot tide arrived." Yes, holy mackerel. We've had some doozies around here in my day--Hurricane Isabel in 2003 left us without power for weeks, and Tropical Storm Ernesto caused more damage to our shoreline than Isabel--but ten inches of rain every day for seven days followed by 80 m.p.h. winds is fierce. Mathews County has suffered many discouraging setbacks, but never such a disaster as the storm which came raging out of the northeast Tuesday night with hurricane force. Never has there been such a storm here, certainly not in the memory of any living resident of the county. Accompanying the wind came a tidal wave which swept over more than half of the county. Points never touched by salt water before were flooded to a depth of several feet. The damage cannot be estimated with any accuracy. Those attempting to figure the destruction which practically every part of the county gazed on Wednesday morning, speak of it in terms of many thousands, even more than a million. Perhaps the most poignantly touching effect is the temporary loss of morale and the utter dejection with which many farmers and fishermen viewed the wreckage and ruin of what in many cases represented practically all they had been able to accumulate around them in a lifetime of hard work and saving. But above all, there was thankfulness, that no lives were lost and that, by some miracle, the raging waters subsided just as many homes were beginning to slip from their foundations." This storm was well before my parents' time, however my grandmother would have been around. Chesapeake Bay Mother probably has some stories that she heard over the years. If the two of you anyone reading has any Great Storm stories and would like to share, please leave a comment here or send me an e-mail. For those of you in other parts of the globe, have you experienced a particularly bad weather event in your lifetime? Was there some story passed down in your family about a devastating event such as the Great Storm? Stay tuned for Part II later in the week, assuming I remember to write it, and there's a 50-50 chance I won't. Here are two pictures taken on different days at Aaron's Beach, my favorite county beach. At first glance, they appear straightforward and simple and they are. There's nothing complicated about what's going on here except for the excruciating analysis which is about to occur. Why keep something simple when it can be analyzed to death? Let's take a closer look. In the top photo, the grasses point in several different directions, sort of like a green hand with fingers stretched out. Now look at the clouds.Now ask yourself why you are still reading this nonsense. Those streaks mimic the shape and direction of the grass. See the white fingers? A similar thing is going on in the photo below. The horizontal line of the branch washed ashore mirrors the board stretching across those posts in the background...and best of all? The clouds, the waves and the horizon are all linear images going left to right, marching right in step with the rest of the photo. Are you ready to march right on out of this post yet? I don't blame you. Although who knows what was going on in my subconscious (it's an extremely dangerous terrain accessible to few), there was no conscious, deliberate effort on my part to take these pictures because of the repetitive shapes. Maybe I liked the flow of the grass in the top one. Perhaps I liked that the branch (from Nature) and the posts (man-made but exposed to the elements) were the same color in the second, but I didn't look much beyond the obvious. In fact I didn't even notice the shape of the clouds until this evening. Isn't that strange? Now for those of you who think everything written here is strange who'd rather be stuck in the eye with a hot poker than discuss the excruciating details of some rather dull pictures, the photo analysis is now over. The psychoanalysis, however, is liable to be a lifelong project. In upcoming episodes of this blog, you can expect a talk about the Great Storm of 1933; about how Mobjack Bay wasn't always called Mobjack Bay; and maybe even a little something from the 1962 Mathews County Soil Survey, who knows. Also, thanks to Pueblo Girl, I am considering a 3-part story about my move from Mathews to the City back to Mathews again, but that requires way more thought and contemplation than the 3 1/2 minutes normally devoted to these posts. Last but not least, is it Friday yet? Monday was as long as three days, which is approximately how long it will take you to wade through this post. This is a sunset from a 2008 camping trip over on the Eastern Shore looking out towards the bay. The sky and that lone pine tree put on quite a performance each evening, except for that one night when horizontal rain and hurricane-force winds forced us to remain inside the camper crying praying for survival. But this is not a story about a disastrous family camping trip, it's a brief talk about forecasting the weather. Although today we have radar technology providing anybody's best guess our 7-day forecasts, not long ago people relied on Nature's cues to anticipate weather changes. Some still do, especially around here. Below is some background on the red sky phenomenon. Practical origins for this English nursery rhyme are based on weather predictions and how a red sky at night would indicate fair weather on the following day. In England the words refer to a shepherd who would say that a red sky in the morning was suggesting inclement weather to follow. In America the words relate to a sailor. It should be remembered that there were no weather forecasts, as such, in days gone by and one had to make one's own weather predictions. Those with the most knowledge and experience such as Sailors and Shepherds, whose lives were dependant on the weather, were fully conversant with changing weather patterns indicated by a "Red Sky at night". As I write this, on day 4 thousand of a never-ending nor'easter, the sky is neither red, nor white, nor blue, nor pink. It's gray, gray, gray, with a hint of just shoot me now because we're never going to see the sun again. I'm neither a sailor nor a shepherd, but based on what I see out the window today--high tides and gray skies--I'm predicting yet another day of cold, dreary rain. p.s. Many people in Mathews still take their cues from Nature when discussing the forecast. Some in my family read the Farmers' Almanac religiously. I gave up on believing any sort of official weather forecasts long ago and usually just get up, take note of the temperature when I go out to feed the cats, glance at the sky once the sun comes up and take it from there. This also describes my outlook on life, by the way. No sense trying to predict it, just take it as it comes. the tang of the untainted, fresh and free sea air was like a cool, quieting thought. Piano playing runs in my family and so does forgetfulness. Both of my grandmothers played the piano. One played for the silent movies at or near what is now Village Lanes in Gloucester. The other forced me to sit beside her on the piano bench and sing songs like "Bobby Shaftoe's gone to sea, silver buckles on his knee, he'll come back and marry me, pretty Bobby Shaftoe." This same grandmother forced me to take piano lessons. My teacher lived in the farmhouse at what is now Queens Creek Marina near the American Legion Hall. Her name was Miss Janice, and she was also my kindergarten teacher at that cinder block building right next to the A&P, now Food Lion. I loved her but was not a fan of her dog Cujo. Back when I first started this blog I wrote about Cujo piano lessons and the time my mother drove past me about seventy hundred times because she kept forgetting me where she was going. I was sitting on a fence on the side of Route 198--the very road she was driving on. Waiting. If you click here not only will you read that story but you'll also see the first official comment from Meg of Soup Is Not a Finger Food, and one of the earlier ones from Ms. Foolery, too. Baby Sis tosses in her two cents but forgets to sign her name to the comment. And now here is Chesapeake Bay Mother with her version of the same story. "Once upon a time there was a little girl whose mother dropped her off for piano lessons in the large white house at the end of a winding lane not far from where they lived. The little girl took her lesson and waited for Mother. No one came. She walked to the end of the winding lane hoping to meet her mother on her way to get her. It didn't happen. The big white fence at the end of the lane was just right for sitting and watching for her mother, who would surely be coming soon. And so she did. Cars went by-this way and that. And then it happened. The VW Vanagon ** appeared with Mother at the wheel...and drove right past. A few minutes later, it came back...and drove right past. After passing her daughter more times than a bull does a matador, Mother was able to focus really hard and drove in to get her. The moral to this story is: Mothers don't come with a warning label; but maybe we should and the warning should read, "This medication is intended to cure all your ills and leave you with no side effects. However on rare occasion it may leave you sitting on a fence." * CBW wishes to suggest that Preoccupation Station is the first stop on a one-way trip to Dysfunction Junction. **CBW also wishes to clarify that the driver of a lime green VW bus abandoned her on the side of the road. The Vanagon came along much to her horror when she had her driver's license. Ergo she would have driven herself to said scarring life event piano lesson. p.s. Dear CB Mother: Last week I drove past CB Daughter's soccer practice where I was supposed to pick her up. Three miles later I remembered and turned around. This is a dead crab who makes his home on a comfortable bed of white sand and crispy seaweed beside a beautiful piece of driftwood. p.s. What will you be doing this weekend? We will be jacking up the house and throwing down sandbags in the hopes the rain, wind and tides don't sweep us out to sea. This is a picture of a tree triangle down at Bethel Beach. I wanted to call this an "isosolese" triangle. Google slapped my wrist and told me I really meant "isosceles" and then Wikipedia corrected me even further and said I meant "scalene." Math and geometry were never my thing. English was my thing when I was younger, but evidently everything I learned evaporated into thinning hair. Today is not Let's Discuss the Three Sides of a Triangle Day, but it is Three Thing Thursday, where I share three things and you share three things, whatever you want, anything at all. 1. This week at work I discovered that I cannot retire from my current job until the year 4,098 or thirty days after I reach the age of 102, whichever is later. 2. That assumes two major things: (a) my current job stays where it is until the year 4,098 or age 102 (Ha!) and (b) I will be able to work that long, i.e. no terminal illness, no fatal or debilitating car accidents, no accidental death or dismemberment by fiddler crabs. 3. All my fingernails on one hand broke off--at about the same time--well below the normal breaking point this past weekend. This has never happened to me before. There is only one conclusion: I have a major thyroid ailment--or worse a rare and deadly fingernail disease--that will put me out of work for a few months before I keel over, kick the bucket and croak. All before I can enjoy the golden years of retirement when I turn 102. Now it's your turn to tell me three things, anything at all, whatever you want. Your fears, your hopes, your dreams, your worries. Your recommended doctors for rare and deadly fingernail diseases. Welcome to the Wild and Wonderful World of Marine Biology, hosted by Chesapeake Bay Woman, a certifiable certified word-messer-upper. cbw: Types "comerant" in the search bar and cringes as she presses the enter key. Google: "Um, hi, CBW? This is Google speaking. *cough* Are you sure you didn't mean 'cormorant' instead of 'comerant?' "
cbw: "Well quite honestly I don't know what in the hay I meant, because I couldn't remember the daggone word, and I'm not even sure this is a cormorant bird when all is said and done. Google: "Get with the program. Talk to Wikipedia about cormorants and let me get back to people whose brains haven't relocated to Taiwan." Cormorant (kôr'mərənt), common name for large aquatic birds, related to the gannet and the pelican, and found chiefly in temperate and tropical regions, usually on the sea but also on inland waters. Cormorants are 2 to 3 ft (61–92 cm) long, with thick, generally dark plumage and green eyes. The feet are webbed, and the bill is long with the upper mandible terminally hooked. Expert swimmers, cormorants pursue fish underwater. In Asia they are used by fishermen who collar the leashed birds to prevent them from swallowing the catch. The double-crested cormorant of the Atlantic coast, Brandt's cormorant of the Pacific coast, and the red-faced cormorant, Phalacrocorax urile, are common forms. The glossy black European cormorant is widely distributed in the Northern Hemisphere. A South American cormorant is a source of guano." Google: "Are you kidding me?" cbw: "I was just checking! You never know, there might be some rare bird called a pomerant. Why would that name pop into my mind?" Google: "Ask a trained mental health professional." cbw: "So, there is no bird called a pomerant?" Google: "If you don't stop bothering me, I am going to need a mental health professional." cbw: "I wast just checking." cbw: "Same to you. Only more." These search engines think they know it all. Anywho, is this a cormorant or something else? If you use Google or Wikipedia to find out, do NOT tell them I sent you. Above is a close-up shot of an old collapsed shed. Below is a similar shot from the same property, different collapsed shed. For the time being, we won't talk about where this is. It's just better that way. I like the color, the light and the emphasis on the window in the first shot. The second shot gives more context, but otherwise doesn't do a whole lot for me. Of course as I write this, nothing is doing a whole lot for me. It's cold, cloudy, dreary and Tuesday marks the return to the paying job after a long weekend. It's hard to convey enthusiasm for anything other than a nap and a winning lottery ticket at the moment. What do you think? About the photos, not about the lottery ticket, although if you have some lucky numbers I'll play them. This seagull lives over on the Eastern Shore of Virginia, which is directly across the Chesapeake Bay from Mathews, about 15 miles east as the seagull flies and about 4,000 miles south/southeast/east/north/then north some more as the car drives. In a previous life, the Eastern Shore was the backdrop for many memorable camping trips, one of which was immediately after Chesapeake Bay Son spent seven days in the hospital due to a ruptured appendix. During another Eastern Shore camping misadventure, I wound up in the hospital with a bad back, but really there's no need to equate the Eastern Shore with hospital trips unless you're me in the Chesapeake Bay Family. Then you can pretty much equate any vacation anywhere with a disaster. However, even though Tangier didn't happen, there's still quite the story to tell about my weekend on the Eastern Shore. This story would consist of all the words below, if only I had the energy to weave them all together. Because I have neither the time nor the energy to relay my story, please take a stab at using any combination of the words above to create your own version of events. Whatever combination you come up with will likely be very close--if not identical--to what actually happened. Trust me. Happy Columbus Day, Feliz Dia de Cristobal Colon, one of my favorite federal holidays. Of course any paid holiday is my favorite but those which fall on Monday are the very best. See the stars, the moon and the sun, how they move in silence. This charming little outbuilding sits behind a farmhouse that's for sale down near Onemo. To the left of that flower bush is a garage which houses an old car, a Dodge or a Plymouth, I can't remember which and it really doesn't matter, does it? This would be the perfect studio for an artist or a writer or an amateur photographer or a trespassing daydreamer whose name is Chesapeake Bay Woman person who has some hobby that requires concentration and contemplation. Hoping to find the listing for this property so I could link to it, I searched through pages of local houses for sale. Although I never found this one, I did discover that the Best Value, our smaller grocery store, is for sale. Well, the business isn't for sale but the building is. The price? $1,500,000. According to the handy dandy mortgage calculator, that means if I put down some ungodly amount of money I could own that building for $7,194 per month for the rest of my life! Best value indeed. No, I can think of other ways to spend that kind of money, and it involves Bora Bora, Mai Tais and lazy days. I'm out and about this weekend, and if all goes as planned I will have quite the story to tell come Monday. If things don't go as planned, then never mind. Happy Saturday, the best day of the week assuming you don't have to work, and I don't. Amen. This is a blurred shot of the Islander and a huge moon which visited us earlier in the week. On Sunday I'll post a much better shot, but for today here's a glimpse of how gorgeous La Luna has been. So just glimpse at the moon and close your eyes when you scan the rest of the picture. I always thought this was the harvest moon, but Wikipedia convinced me otherwise. Evidently the harvest moon is the full moon closest to the equinox in September, and the hunter's moon occurs in October. The calendar says it's October, so Sherlock CBW is going to say this is the hunter's moon. The Hunter's Moon (also known as Blood Moon or Sanguine Moon) is the first full moon after the harvest moon, which is the full moon nearest the autumnal equinox. *****!!!! "The Hunter's Moon is so named because plenty of moonlight is ideal for hunters shooting migrating birds in Northern Europe. The name is also said to have been used by Native Americans as they tracked and killed their prey by autumn moonlight, stockpiling food for the winter ahead. The Hunter's Moon and Harvest Moon are not brighter, smaller, or yellower than during other times of the year, but all full moons have their own special characteristics, based primarily on the whereabouts of the ecliptic in the sky at the time of year that they are visible. The full moons of September, October, and November, as seen from the northern hemisphere — which correspond to the full moons of March, April and May as seen from the southern hemisphere — are well known in the folklore of the sky. ...All full moons rise around the time of sunset. The Harvest Moon and Hunter's Moon are special because - as seen from the northern hemisphere - the time of moonrise on successive evenings is shorter than usual. ...Thus there is no long period of darkness between sunset and moonrise, around the time of these full moons. In times past, this feature of these autumn moons was said to help hunters tracking their prey (or, in the case of the Harvest Moon, farmers working in the fields). They could continue tracking their prey (or bringing in their crops) by moonlight even when the sun had gone down. Hence the name Hunter's (or Harvest) Moon. In the northern hemisphere, the Hunter's Moon appears in October or November, usually in October. Traditionally, it was a feast day****** in parts of western Europe and among some Native American tribes, called simply the Feast of the Hunter's Moon, though the celebration had largely died out by the 1700s. There is a large historical reenactment by that name in Lafayette, Indiana during the early part of October. *****!!!! The word "moon" is used six times in one sentence, and I didn't write this sentence, Wikipedia did. Why do I feel vindicated? ******There you have it, folks. Wikipedia is telling me that I must feast to keep the tradition going strong. That's my interpretation, anyway. Pardon me, I have some eating to do. p.s. What do you think - is this a late Harvest Moon or the Hunter's Moon? Am I the only one who hadn't heard of Hunter's Moon before? Or, am I the only one whose brain revolted and dumped all functioning memory cells in a ditch somewhere between U.Va., Northern Virginia and Mathews a few decades ago? Here's a shot of one horizon, two seagulls and four tall posts. While we're frolicking in the sea of so many numbers, and to assuage the fears of those who cringe when things are missing or out of sequence (one-two-four, anyone? ), I'd like to welcome you to Three Thing Thursday, where I tell three things and you tell three things--whatever you want, anything at all. So, to recap: One horizon, two birds, three things to tell, four tall posts. 1. The past several nights have been heavenly. The cool, crisp air and so many bugs singing evening ballads make for some incredible sleeping, particularly with the sliding doors and windows open. The 5:30 alarm and associated swearing are not included in this lovely image of the past several nights. 2. The Chesapeake Bay Children and I marvelled over what we called the harvest moon, a huge, incredible moon rising from the east each evening. There's another similar moon phase called the hunter's moon, and because we lack attention to anything to detail we're not sure which one we've admired. I'll need to do some searches on Wikipedia research and get back to you on this whole moon thing. No matter what it is called, HOLY MACKEREL, it's a gorgeous moon. Or it was. I think it's gone now. 3. Tonight I made a bonfire outside just off the back patio, and as I write this it's still going strong. The scent of burning wood and leaves, the cool, crisp air and the songs of nocturnal insects floating through the open windows have just persuaded me to declare a new found love for fall. Remind me next year to take any vacation days I may have during the first two weeks of October. 4. I really love the word "assuage." Not only do I like how it sounds, I like what it stands for. Now, please have at it. Tell us three or more things. Write whatever you want. There are no limits (even to the number of things), no boundaries, no rules whatsoever. Keeping with this week's theme of "Even Chesapeake Bay Woman is Bored With Her Blog," today I'd like to ask a few questions. Feel free to respond in the comment section--anonymously if you wish--or send an e-mail to ChesapeakeBayWoman@gmail.com. Or, just stick your fingers in your ears and go "lalalalalaIsthisoveryet?lala"
1. Is there something you'd like to hear more about? Less about? 2. Do you have a question for me or my family that I--or they!--could answer in a post? 3. Do you have a question about Mathews? 4. Can you tell the well is running dry and/or I'm too tired to invest the energy to think up topics? 5. Socks and shoes. Are they really necessary? Thank you for participating and/or indulging me and/or enduring me. Because even I am bored with this blog, I've decided to do something different. First, there are two pictures today instead of only one. Wow, Chesapeake Bay Woman, you've really stepped outside your comfort zone! Have you thought about getting a life? of any other new and unusual things for this Two Shot Tuesday? I'm glad I you asked. Second, we're going to decide which of the two we like better and explain why. If this sounds like a compare and contrast question from first grade high school, I apologize. Actually, I'm curious to hear your opinions because so often pictures I don't like seem to resonate with others and vice versa. I'll go first because I can. However, in real life, the second shot was the essence of what I was trying to capture. See that archway of tree limbs just above the truck? The trees formed a tunnel around the truck. The headlights were like eyes peering out, unsure and very uncomfortable at the prospect of leaving the protection of the trees. What do you think? First or second shot? Which one do you like better and why? If you don't like either one, that's fine too. There are no right or wrong responses. For those of you preparing to run away screaming at the thought of discussing some barely discernible differences between two mediocre photos, answer this: Am I the only one who played with Tonka trucks as a kid? I had a red one that looked very similar to this one, and it was my favorite. I love trucks, especially old ones. Above is a close-up of a dead crab near some dead seaweed, on top of some dead pebbles and sand. Welcome to Monday, where I state the obvious about pebbles and use the word "dead" three times in the same sentence. Here lately on my trips to the county's public beaches, I've taken the perfunctory shots of the horizon, the bay and the surrounding marshes but have suddenly discovered a whole new world at my feet, a world which does not require an exfoliating scrub. Let me just pause for a moment to tell you how much I love the word "perfunctory," probably because "funk" is right there in the middle and it makes me laugh. At this juncture, I'm just checking to see if you're awake. If you aren't, stay tuned, here's a little more to ensure a deep, comatose state of slumber. Anyway, all of a sudden I've noticed these incredibly beautiful, artistic displays created by Nature and have become obsessed with shooting them. Not with a gun but with my camera, of course. There are other things I may or may not be obsessed with shooting with a gun, but a dead crab is certainly not one of them. Ants, fiddler crabs, houseflies, horseflies the size of buzzards, buzzards, tent caterpillars, spiders, moths, mosquitoes, Mondays, and utility bills are all examples of things I'd consider using for target practice, but this is neither here nor there particularly if you're asleep, and I suspect you are by now. Furthermore and in conclusion, close-ups of dead crabs, shells and seaweed will likely become part of the repertoire of monotony seascapes and old houses that make up Sleep Life in Mathews. Welcome to Monday morning Chesapeake Bay Woman style--replete with dead crabs, dead rocks, annoying insects, a subconscious desire to use firearms, and the rants of a person who loathes the start of the work week. If it is 5:30 a.m. or later Eastern Standard Time, you can rest assured I am uttering a few or more expletives while imagining which insect, bill or day of the week I'd like to shoot if I (a) had a gun;(b) knew how to shoot it; and (c) could actually shoot a day of the week and get away with it. Do you like Mondays? If you do, why? If you don't, how do you make Sunday nights better such that you're not wanting to shoot something dreading the dead-as-a-rock feeling of impending doom known as Monday? In other news, if you read Saturday's Death of a Silo, you need to check out the exquisite photos taken by Country Girl Kate (go to her Picture a Day section) and Daryl. They're beautiful shots. p.s. I don't really want to shoot anything other than the bills which require me to work, and I'm not usually this despondent except for Sundays, Mondays, most Wednesdays, the end of summer and the day after Christmas. Lived a beautiful old barn on the Chesapeake Bay. Perched on Waverly Lane--Queens Creek was its home. With height so impressive, it spoke to the clouds. The silo still managed to look very charming. She stopped dead in her tracks-the silo was gone! Her mother explained that she was worried a piece of the old silo would fall and hit her on the head while she was tending to her garden (which isn't even beneath the silo). Since workers were already on the property with excavators, bulldozers and armored tanks to put the riprap around the shoreline, her parents instructed them to tear down the majestic silo. Chesapeake Bay Woman felt like she'd been kicked in the gut. She loved that silo. p.s. Foster Faulkner Funeral Home is handling the arrangements. Expressions of sympathy may be made by running out right now to photograph something you adore, because you never know when parents will have bulldozers and excavators at their beck and call. Services will be private. p.s.s.t. If you click on the photo, you can see the details of the silo even better. Australian Annie is excused from this exercise if it takes more than two seconds for the photo to load. Have a great Saturday. Remember the silos. This is a recent shot of an old store down Onemo. To fully appreciate this lesson in how not to take a photo picture, please double click the image. Then you'll be able to see the gargantuan spider web as thick as a hammock just waiting to strangle me any trespassers who venture too close. Next, you can study the eerie light shooting down the right side of the porch which of course can be attributed to a phantom. Yes, that's it--a ghost. Even though some might say Chesapeake Bay Woman's amateur photography skills are to blame, I'm going to stick with calling it a phantom because this is my fantasy world I can. Like most of the old country stores, which often housed a post office and the owner's family as well, this store is located at an intersection. I sure hope that intersection was busier back in the day because currently it's possible to stop the car in the middle of the road, roll down your window and take pictures at your leisure. It's so quiet you can practically hear your heart pounding out of your chest when a car pulls up behind you that spider discussing his meal plans with the ghost. With any luck, those meal plans do not involve you. "...Water landings and crossroads became natural locations for the scattered residents of Gloucester to gather...The different sections of the county were customarily indicated, not by signposts, but by crossroads that had a general store or gristmill on a corner. By such landmarks one knows when he is passing from one neighborhood to another." "...Motorized travel over land became more common, and services formerly provided at landings increased in importance at inland crossroads. As travel sped up, the need for as many stores and post offices decreased and many were abandoned." Many of the old stores are disappearing into their surroundings. Some are being swallowed up by nature, others are falling in on themselves due to neglect. If you look hard enough, though, you can see something there. A glimmer of a life past. A phantom. Do you have any memories of a country store? Have you seen these killer spider webs that are as thick as hammocks? Any thoughts on Phantom of the Camera, the phenomenon captured above? Have a great Friday, I'll stop rambling talking now. I took this a while back, probably in late July or August, from the road across from the old M&G in Gloucester (now a seafood operation of some sort). Off in the distance is a soybean field, but the tree in the foreground was what initially caught my eye. The trees further back serve as the picture frame for the soybeans and the sky. This was how I saw it anyway. Thursday is upon us once again, and that means it's time to share Three Things. 1. After replacing all batteries; after removing every single smoke detector in the house; even after turning off the power source my house continues to try to kill me the smoke detectors are still chirping. When they started squawking up in the children's bedrooms, I had to burst into tears for the third time today consider that the house just may be possessed. 2. For the past two days, my computer has been freezing up on me big time. I've tossed my cookies; emptied my trash cache and reconfigged my fig, but 8 times out of 10 I have to shut down and reboot. If you don't hear from me over the next several days, you'll know the computer has finally gone where it belongs: Hades the bottom of Queens Creek. 3. Thank you to those of you who comment here, whether it's every day or occasionally, or if you've just joined the insanity already in progress. You have no idea how much it lifts my spirits. If you read and don't comment, I'd love to hear from you. If you read and don't want to comment, that's fine too. Just know I appreciate it. So there are my three things, now it's your turn to share three--or more--things. Whatever you want. Anything at all. Whining is all I ever seem to do encouraged and respected.